well... this is not made by me, i think i can't make it for my life time. Gianni is good in hand carve stamp, she can carve very detail line, pattern and words. See the lace stamp she hand carved for meiweihuang handmade, i can't imagine how much time she took to made it... but i bet mei wei will love it. 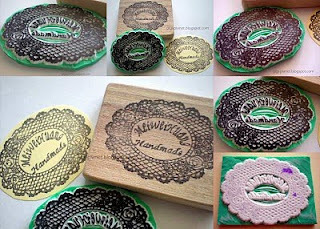 Click here if you would like to have a custom made hand carve stamp.